I'm pleased to announce the completion of my entry for the RaNGE 19 Contest! Features a Marisa boss. Please let me know if there are any issues. Some rigorous testing has hopefully ensured that the script is bug-free, but there may be residual issues remaining. EDIT (Jun 20): New update. This update forces the last spell to have two circles on each side, and fixes a (0, 0) spawning error. In addition, it makes Spell 3 on Hard a little harder. EDIT (Jun 20): Apparently the system script was still using Teiki for accessing common data, meaning that when playing the game, the high score would never be rendered. This has been fixed. This update should not break replays with v0.10 RC-4. Yay contest results out; I can edit my entry now. New download on Bulletforge fixes the menu issues found in ExPorygon's stream - namely, that I removed two difficulties but forgot to limit as such on selection (so you could scroll past the existing difficulties on the difficulty select menu) and the issue where Reisen's name in Japanese just shows up as squares (installed a font; unfortunately it increases the file size substantially). ph3 Tutorials Lesson 29 (Primitives and 2D Sprite Lists) is FINALLY out. Well, the primitive portion was technically complete a month and a half ago and I just procrastinated, but hey, it's out now. Sprite List portion has not yet been thoroughly fact-checked; please be aware that it may not be at the same standard as everything else. I would now like to announce the commencement of my next standalone script, which is my entry for the RaNGE 20 Contest hosted by Trickysticks? here on MotK. 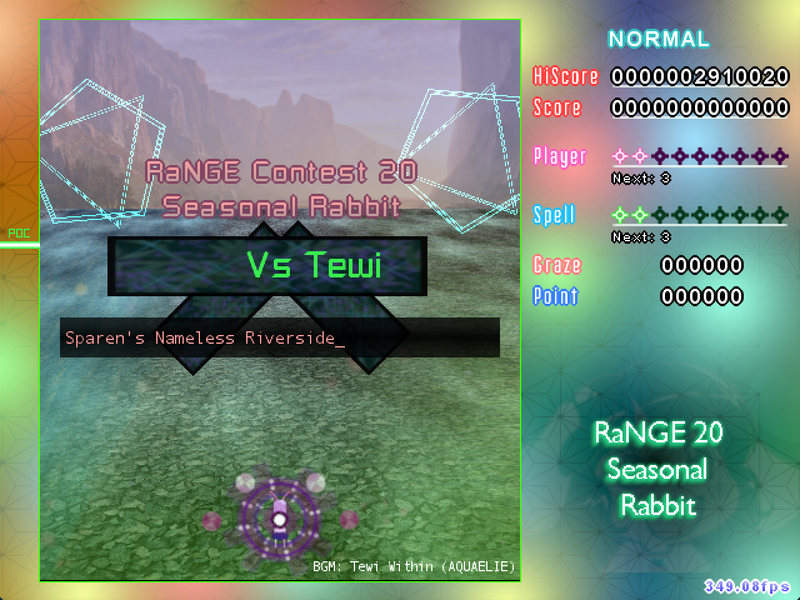 This script features my Reisen player and a Tewi Boss, acting as a 'sequel' to my RaNGE 19 entry. As April 1 is near, I am providing two difficulties for this script - one for standard play and one for more... unique play. Since I copy-pasted SeitenTouji's system over via RaNGE 19, continues, extend systems, Spell Practice, and a number of other things are automatically built in and will be implemented. My entry for the RaNGE 20 Contest is now available! Featuring Tewi! And Reisen! And a light sprinkle of memes! Comes in two flavors - Normal and Abnormal. May also contain a rare crash in Spell 008 (attempted to fix; unable to find reason why it crashed). Note that due to the same spell spawning exceptional amounts of bullets, dawdling for too long can cause issues with Danmakufu. But that's a different story. An update has arrived for my entry for the RaNGE 20 Contest! As expected, spawning stupidly large numbers of bullets caused problems! But alas, perhaps those have now been solved! Potentially addressed issue where forcefully deleted bullets prior to the boss dialogue would not have their ongoing tasks terminated, resulting in those tasks continuing to fire after Danmakufu reassigned their Object IDs during Spell 4 on Abnormal difficulty. This might address the potential crash in Spell 4 on Abnormal, and should also prevent random laser explosions from the stage enemies mysteriously occurring during or after Spell 4 on Abnormal difficulty.